The ancient Khmer ruins known as Ta Muan are situated on the Cambodian border in Phnom Dong Rak district, far southwestern Surin province. The historical site actually consists of three separate temples: Ta Muan, Ta Muan Toch (or Tot) and Ta Muan Tom. Ta Muan, the first you will come across and the smallest of the three, is a 13th century, Jayavarman VII period, laterite chapel thought to have served as a kind of rest house or way station for travellers on the ancient road from Phimai to Angkor. Jayavarman VII constructed a whole series of almost identical shrines throughout his kingdom along his extensive road network. This one is simple but in very good condition: a single laterite tower with attached, window-lined chamber. The tower still has the original lotus flower-shaped tip and the eastern doorway has a well-preserved lintel depicting Buddha seated above Kala. A short distance up the road brings you to Ta Muan Toch, or Tot, meaning small Ta Muan in Khmer, although confusingly it is larger than the previous temple. Ta Muan Toch dates from the same period and was a hospital chapel -- meaning a Buddhist temple attached to a presumably wooden and long since rotted away hospital. Jayavarman VII also constructed these hospital chapels, using a standard design, throughout his empire and you can see another near Ta Prom temple at Angkor. These hospitals were generally constructed outside of major towns and were probably staffed by priests/doctors handing out medicines, remedies and blessings for the afflicted. It is interesting that they are nearly always found outside of, rather than in, towns, so maybe they were dealing with some infectious diseases here or perhaps leprosy, which they thought required isolation. There are rumours of at least one of the Angkor kings being affected by leprosy -- some historians have even suggested Jayavarman VII himself -- so the rulers would certainly have been sympathetic to leprosy sufferers and concerned with their treatment. The Angkor period town then must have been situated somewhere between here and the Ta Muan Tom ruins a little further up the hill. Ta Muan Toch consists of the standard hospital chapel layout of laterite enclosure wall, eastern entrance gopura, central sandstone tower on a laterite base and small laterite “library”. These ruins are remarkably well preserved, having undergone restoration work by the Thai Government as the other two sites have. The ruins are very simple with no carvings or decoration as such but an interesting Sanskrit inscription was found in the entrance gate noting down royal donations to the temple as well as a hospital staff list -- the stele is now in the National Library in Bangkok. A little further up the hill is Ta Muan Tom (big Ta Muan in Khmer), situated right on the border itself. As with the other two sites there is no entrance fee and you will be met by black uniformed Thai Border Patrol soldiers rather than temple ticket collectors. The Khmer border point and soldiers are located on the opposite, south side of the temple so Ta Muan Tom is more or less in no-man’s land. Unlike Khao Phra Wihan (Preah Vihear) there has been minimal border squabbling here and as of mid 2015 it was open to visitors, but it’s worth checking before you come all the way out here. Note that the land around the temple was mined during the Khmer Rouge days, so don’t wander off. The temple itself is 10th century, possibly Suryavarman I period, so older than the previous smaller constructions, but their presence indicates it was still an important site two centuries later. Though larger and more complex than the others it is unfortunately in much worse repair. The Thai Fine Arts Department has managed to restore some of the towers and walls but its use as a Khmer Rouge army base for several years meant that most of the carvings have been damaged or looted. Ta Muan Tom was dedicated to Shiva and indeed the temple’s central shrine was built around a natural lingam-shaped rock. The significance of this linga is indicated by the fact that considerable terracing work was required on the steep south side of the temple in order to provide enough level ground to site the temple on. Much of this level ground is actually bare sandstone and an unusually long ’soma-sutra’ (a channel for collecting water purified from having been poured by priests over the linga phallus) was carved in the rock bed leading right across the courtyard from the central shrine. Also unusually the temple, like Phimai, faces south, and no satisfactory reason has been found for this. Sure it’s the direction of Angkor and looks out across the plain but the similarly sited Phra Wihan is north facing and indeed a north alignment would have made Ta Muan’s construction a damn sight easier. Ta Muan is located way down at the end of Highway 2407, 83 kilometres southwest of Surin town. If going under your own steam, head south on Route 214 to Prasat and then continue due south on the same highway, keeping an eye open for a turn on the right signposted Ban Kruat and Ta Muan. This will put you on Route 224, from where you can follow signs to the ruins after another 30 or so kilometres. 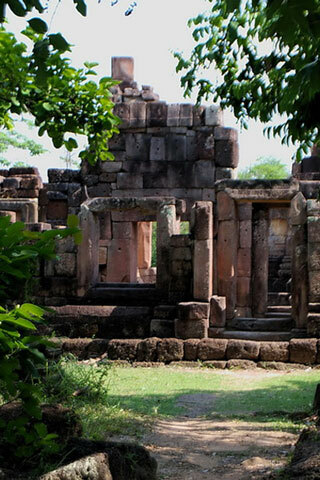 The ruins are also accessible as a day trip from Nang Rong (west of Phanom Rung) and Buriram town.